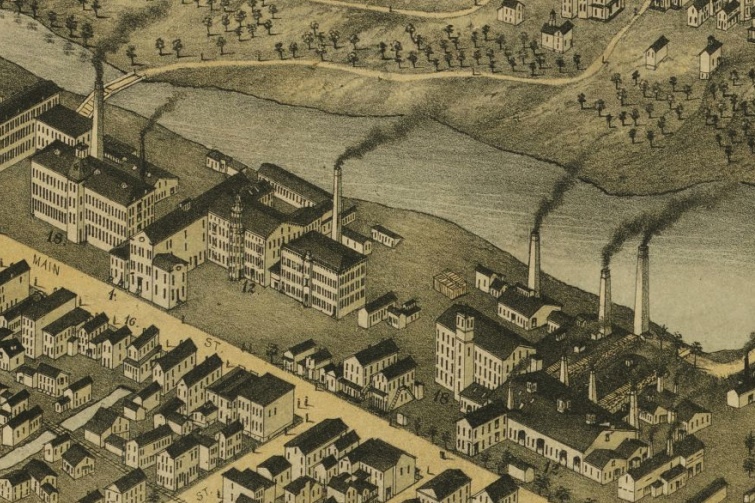 Detail from the bird's-eye map View of Ansonia, Conn., 1875, O.H. Bailey & Co. The building identified as number 12 is the Ansonia Brass & Copper Company. Before the large-scale industrialization of the early 1800s, brass products were made by individuals working in their homes or in small shops. Brass buttons were a particularly popular item that provided the foundation for the brass boom in the Naugatuck Valley. In 1834, three men partnered to open a brass mill in Wolcottville (now Torrington) that was the heart of what eventually became the Wolcottville Brass Company. One of the men, Anson Greene Phelps, was co-founder of the Phelps Dodge Company. It was largely from mines owned by Phelps Dodge that Wolcottville and other valley companies got the copper used in making brass products. Anson G. Phelps from the book The Brass Industry in Connecticut by William Gilbert Lathrop, 1909. The Wolcottville enterprise proved highly successful and ten years later, Phelps founded the Ansonia Brass and Battery Company in Ansonia. 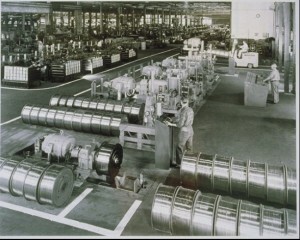 It was a sprawling facility with a variety of interconnected buildings and shops housing the different processes involved in brass manufacturing. 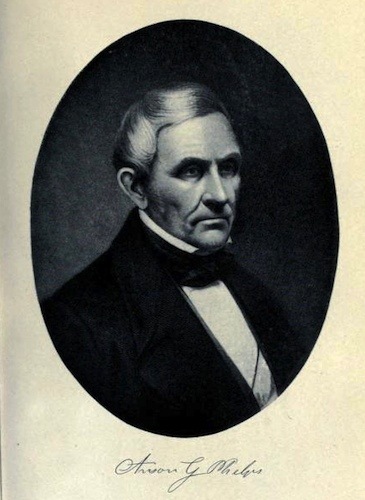 The establishment of the new plant also signaled the move of the locus of Connecticut’s brass industry to the southern valley, particularly to Ansonia and Waterbury. After complicated and sometimes contentious negotiations between several companies (including some that signed on at first and subsequently withdrew) a consolidation of five businesses resulted in the founding of the American Brass Company (ABC), which officially began operations in 1899. The company grew steadily through the early 20th century, and at its peak, the its workers turned out an astonishing two-thirds of the brass products manufactured in the United States. In 1922, the Anaconda Copper Mining Company, a giant corporation with holdings throughout the world, bought American Brass. Though operations initially continued unabated, the takeover by Anaconda eventually helped facilitate the demise of ABC and the Brass Valley. Company owners and officers with valley roots soon found themselves replaced or overshadowed by those from Anaconda, which was based in Montana and had no prior presence in Connecticut. Anaconda, with its vast international holdings, brought an entirely different culture to brass production than previously experienced by Torrington-based mill owners. Many aspects of work at ABC were difficult and dangerous. The heat in some sectors often proved unbearable and injuries, some quite serious, were a regular part of the job in many buildings and units. As is common in such difficult conditions, a fair degree of solidarity existed between workers, solidarity that, during strikes for example, transcended the differences between the many ethnic nationalities employed at ABC. 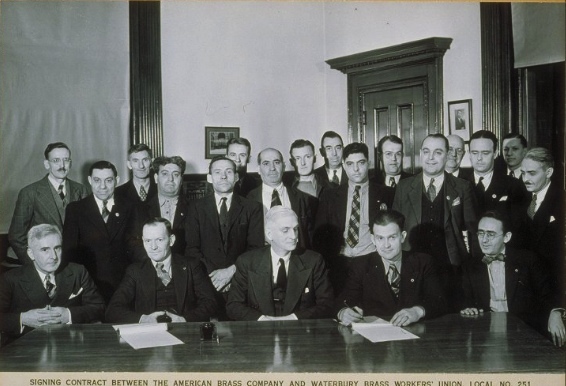 In the late 1930s, ABC workers achieved collective bargaining recognition. Unionization and the business boom that began during the Second World War led to higher living standards and allowed many brass workers to,for example, purchase homes for the first time. During the 1950s, ABC continued to thrive (along with the rest of the Brass Valley). The company changed its name to Anaconda-American Brass in 1960. When the American economy began a downturn in 1973, ABC and the lives of its workers changed. With its global reach, the company shifted production to places with greater profit potential. ABC’s Connecticut workforce steadily declined and management increasingly demanded givebacks. This only grew worse in 1977 when Anaconda became a subsidiary of Atlantic Richfield (ARCO), one of the largest corporations in the world. There was resistance by workers and concerned valley residents to ongoing closures and cuts, but the company maintained the contractual right to all production decisions. ARCO continued to shift production away from the valley and ABC in Connecticut continued to shrink until it inevitably ceased operations. The last remnant of ABC, an entity known as Ansonia Specialty Metals, closed as recently as 2014. Brecher, Jeremy. Banded Together: Economic Democratization in the Brass Valley. Urbana, IL: University of Illinois Press, 2011. Roth, Emery. Brass Valley: Limited Edition. Waterbury, CT: Another Straw Hat Production, 2013. Mayko, Michael P. “Anaconda American Brass Co.: Pieces of History Fall in Ansonia.” Connecticut Post. October 28, 2015. Juliano, Michael. “Official Confirms Ansonia Specialty Metals Will Close.” Waterbury Republican-American. April 25, 2014.